Your Lavender Fund will help us to support people affected by epilepsy through our cutting edge research, awareness campaigns, helpline and our information and support services. As your own special tribute, this online page can become a place of comfort to visit any time or place, in order to help you remember and reflect. You can do many things including posting stories, favourite pictures and memories, or lighting a candle. Privacy settings allow you to choose who can access your page and when. If you already have a MuchLoved account and wish to see all the tributes that you have created plus any others that you have personally been invited to, please click here to login. If you are taking part in an event in memory of someone then ask people to donate to your Lavender Fund. 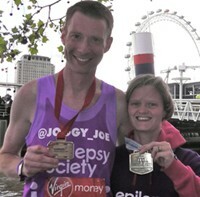 Help us make a difference to the lives of over half a million people living with epilepsy in the UK. Supporting us at your special occasion or fundraising event is a rewarding and thoughtful way to help. Why not ask guests to make a donation to your Lavender Fund instead of a gift at your birthday or wedding anniversary, or perhaps in lieu of flowers at a funeral service.